This Holiday season discover the perfect gift at the BBCAmericaShop.com! Plus, it’s back! 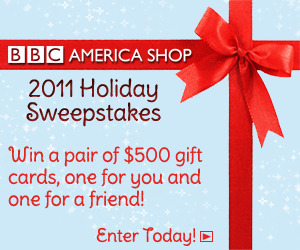 The annual BBC America Shop Sweepstakes giving you a chance to win two $500 Gift Cards for you and a friend: https://bitly.com/BBC_Sweeps (Valid toward your purchases on the BBCAmericaShop.com). Oh, my, I'd love to win the $500 gift card. Not only do I have plenty of ideas on what to spend it on, but I have loads of suggestions for my friend (who would get the other card)! Enter to win a BBC prize pack!!! Thanks to BBC, I have an amazing prize pack to award to one lucky winner! There's such a great variety of items here, that you can find a gift for everyone on your list if you win these fantastic prizes! Planet Earth: Special EditionYou'll be filled with awe and amazement every time you watch this stunning BBC series about our planet's best-loved, wildest and most elusive creatures, captured on breathtaking, high-definition film in the Earth's most extreme habitats. Forty cameramen and hundreds of producers, scientists and guides spent four years and $25 million to bring you this God's-eye-view of rare action and intimate moments in impossible locations. Laughs and holiday cheer abound in these eight hilarious BBC Christmas specials. Catch the festive spirit with the residents of Dibley as they put on a pageant or with the Goods and the Leadbetters of Good Neighbors as their Christmas celebrations go terribly awry. Featuring specials from Are You Being Served, Good Neighbors, To the Manor Born, Allo Allo, Last of the Summer Wine, Keeping Up Appearances, Blackadder, and The Vicar of Dibley, this collection is a must have for any fan of British comedy! Share the magic of a mother-daughter day trip as you walk past the Changing of the Guard at Buckingham Palace, through the Whispering Gallery at St. Paul's Cathedral, and on to the amazing jewels at the Tower of London-learning fascinating facts as you go. See if you can spot the royal family's car, and ride a ferry on the River Thames. A fun children's book you'll both enjoy. Hardcover; 34 color pages, plus panoramic foldout. While Annie the ghost waits in purgatory to learn her fate, her supernatural friends- Mitchell the vampire and werewolves George and Nina-settle into their new home in Wales, hoping for a fresh start at living normal lives. Brace yourself for out-of-this-world adventure when Mitchell decides to rescue Annie. All eight new episodes in the hit BBC series, starring Aidan Turner, Russell Tovey and Lenora Crichlow. Many extras. Romola Garai, Dominic West and Ben Whishaw star in The Hour, a thrilling six-part drama set in 1950s London when the BBC is about to launch an entirely new way of presenting the news. The dynamic Bel (Garai) is chosen to produce the new program, to be called "The Hour," with handsome and well connected Hector (West) set to become the anchor, much to the annoyance of Freddie (Whishaw), a brilliant and outspoken journalist, whose passion continually lands him in trouble. Over the six episodes, the interplay of intense ambitions between our rising news team play out against the backdrop of a mysterious murder and Freddie's controversial and dangerous investigation. The delightful star of Eric Hill's beloved children's books joins his friends as they embark on a special magical ride to help find Santa's special Christmas sleigh-before it's too late. As a reward for his help, Spot finds a big surprise under the tree on Christmas morning! Bonus episode: Spot's Winter Sports, featuring Haley Joel Osment (The Sixth Sense), plus two games. The trio is back in Gear for their latest supercharged season. Whether they're torturing a Jaguar, Mercedes, Bentley, Ferrari, Porsche, BMW or Audi or chatting up a "Star in a Reasonably Priced Car," the guys never fail to deliver their irreverent wit and nearly slanderous honesty. Six episodes, highlighted by the "Middle East Special," a seasonal road trip recreating a famous journey across the Middle East to Bethlehem. 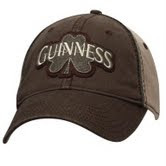 For good luck in warmer weather, top your day with the appliquéd shamrock on your Guinness baseball cap. Easily adjustable Velcro headband. One size fits most. Wow! All these great gifts are up for grabs for one lucky winner! To enter, just leave a comment on this post stating what you most want Santa to bring you for Christmas. Be sure to include your email address so that I can contact you. Due to shipping costs, this contest is only open to US residents. Last day to enter is Dec. 14. Good luck! Disclaimer: I was provided with the prize pack to giveaway by BBC. I received no compensation for hosting this contest. I most want santa to bring me a fitbit because it seems like a really neat and helpful toy! I'd like Santa to bring me a fur coat, to keep me warm when I watch my DVD's and read books to children...actually, a furry little dog to adopt and love! I want Santa to bring me a new Laptop. I just want Santa to bring me time with my family. I would like santa to bring me a new stove. I would like to get an Apple Iphone for Christmas! I would like to be suprised. I'd like a laptop computer. Xbox Kinect and the game Disneyland Kinect. I would like Santa to leave a chef that would cater for a few days! I would love to have a new television. Mine isn't digital, very poor reception! How about a new wardrobe, mine it really outdated! I would like Santa to bring me a nice cozy robe and some super warm slippers. Minnesota can be a chilly place this time of year. I'd like a new pair of birkenstock sandles for Christmas. Well, I would love to have an iPad, but that's not happening with our two kiddos in college. I would love to see a Wii under my tree! the doctor in his tardis.. but since that is impossible uh... an ipod touch? I most want Santa to bring me a Playstation 3 for blu-rays as well as games. I most want St NIck to bring my hubby good health and then I'll be happy with some good chocolates! I would love for Santa to bring me an iPod this year. I most want an elliptical trainer for Christmas. I want Santa to bring me some fiesta. I would love santa to bring me a nook color. i want santa to bring me a kindle fire. I would like a kindle for Christmas. Thanks for having the contest!